I am coming to the end of what may be my last term teaching. While I hope it isn’t the end of my higher-education teaching career, I want to take this opportunity to be self-reflexive, and to encourage all of you to be self-reflexive alongside me. 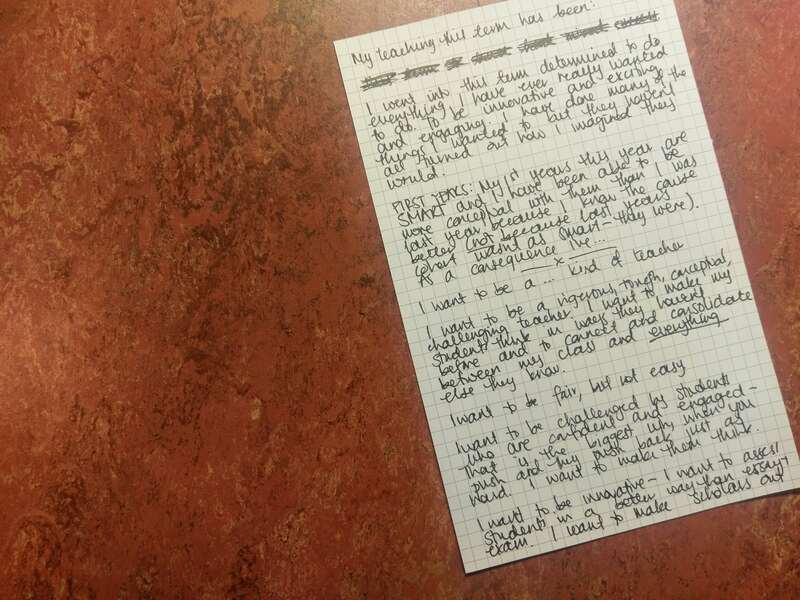 One of the self-reflexive activities that I do (on my own and with my students) is free writing. In the spirit of being self-reflexive I have done some, and (perhaps unwisely!) shared it below. I’d like to encourage you to take some time, as we approach the end of term and the end of the year, to do some free writing and be honest with yourself about what needs improvement. And, please feel free to share some or all of your free writing (either in comments below or leave a link!) or your impression of the free writing/self-reflexive process. I went into this term determined to do everything I have ever really wanted to do. To be innovative and exciting and engaging. I have done many of the things I wanted to but they haven’t all turned out how I imagined they would. I want to be a rigorous, tough, conceptual, challenging teacher. I want to make my students think in ways they haven’t before and to connect and consolidate between my class and everything else they know. I want to be fair, but not easy. I want to be challenged by students who are confident and engaged – that is the biggest win, when you push and they push back just as hard. I want to make them think. I want to be a clear, engaging/engaged boundary pushing scholar. I want to think about things in new ways. I want to do things that make non-scholars, non-students, non-engaged-people really see what is AMAZING about the ancient world. *Three minutes is never as long as you think it’s going to be. I think I am the kind of teacher I want to be, in a fledgeling right-at-the-start-of-my-career kind of way. I think the big thing that’s stopping me from thinking that I am that kind of teacher is that being at the start of my career, sometimes there are things I am jazzed about trying that just don’t work. Teaching is trial and error, in part, especially innovative teaching. And while it’s always ongoing (because you’re different, and students are different, and courses are different, etc. ad nauseum) I don’t yet have a full repertoire of teaching tools. But, I’m getting there – and I think I’m doing a good job. So, hooray me. And hopefully you’ve learned something about yourself as well – and I’m looking forward to reading some of your free writing too!